Calling all bards! Get ready for the greatest musical event ever to strike role-playing-games! OK, the only musical event ever to strike role-playing-games. But you get our drift! Welcome to BATTLE OF THE BARDS. It’s time to face the music! It’s a song competition and it works like this: you create a song, you record and send it to us, and then legions* of adoring fans vote for the winner. We’ll take the winner and make an awesome animated video with it which you can take and show to your friends; we’ll publish it on our YouTube channel, too. And we’ll offer you a paid contract to write (and possibly perform) a song in our animated show, THE PERTURBED DRAGON. No, nobody’s gonna get rich or famous from this – not you, and not us! It’s all in the name of fun and community. So, if you feel it’s something you might find fun, give it a shot! 1. You may enter multiple songs up to a maximum of three entries. 2. Your lyrics must be an original creation. You may compose your own music (an original composition) or you may use existing music and set your words to it (a song parody along the lines of Al Yankovich). 3. Your entry can be serious or funny, happy or sad – anything you want. But it must be about RPGs in some way. 4. You should record your entry in .mp3 format and send it to morrus@hotmail.com and cc it to ddvmor@gmail.com with the subject line: “BOTB Song Entry: [Song Title]”. One email per entry. 4a. Alternatively, you are welcome to send us a video instead, with the same email requirements. Videos can be in any major video format. 5. You must also include the full lyrics of your song! 6. Your email should also include: your name(s), song name, your location (town – we don’t need your full address at this stage but we need to be able to say “Bob from Springfield” or wherever). You MAY choose a stage name or a group name instead of your real name(s) if you prefer not to make your real name(s) public, but we must know your real name(s) for legal reasons. If you prefer us to refer to you by your chosen stage name, let us know in your email. 7. Your email MUST also include the LEGAL STATEMENT noted below or it will be discarded. 8. Your entry will include no profanity or statements of an offfensive, racist, sexist, or other discriminatory nature. This is a family-friendly event. 9. 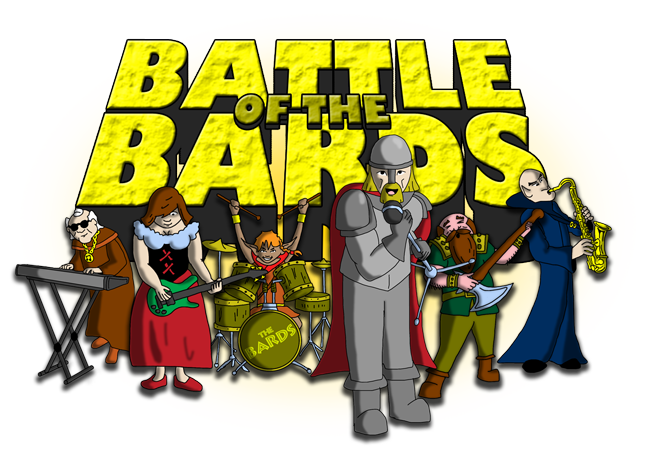 BATTLE OF THE BARDS is open to all amateur and professional songwriters and anyone regardless of nationality or origin. 10. Entrant retains all ownership rights to all submitted song(s). EN World will not have any ownership rights to any song(s) submitted. However, you will be granting EN World a license to use the song(s). 11. All genres of music are admissible. You have until 31st October 2012 to send in your entry. Entries received after midnight at the end of that day (GMT) will NOT be counted. Public voting will begin on November 5th and will last until the end of that month. We reserve the right to split entries into separate categories if necessary. Voting will take place on http://www.enworld.org. All valid entries will be made available for public voting. The exact method will be announced at the time. What this means is that EN World is protected in case you go all crazy and decide to start suing us, or in case you ‘borrowed’ your friend’s work without telling him; and gives us the ability to flexibly use the work without hindrance in order to effectively run the competition. It doesn’t take away your ownership of your work. The most important thing – have fun! Don’t take this too seriously; it’s all in the name of fun. We hope you enjoy it and that some entertaining things come out of it for everyone to enjoy! Please note: this is a mirror of this page on ENWorld.